Each year on the feast day of St. Rita, roses which have been brought to her shrine are blessed and placed before the shrine. 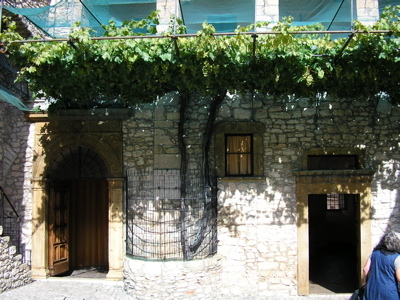 It is a practice that takes place at many Augustinian Monasteries and Convents. When the petals of the roses dry they are packaged by the sisters and distributed. The rose petals shown here were obtained from the Convent in Cascia. After the grape harvest each year, the leaves from the miraculous grape vine of St. Rita, which still grows outside her cell, are pulverized and packaged. They are made available for the sick. Many cures are associated with the Miraculous Grape Leaves of St. Rita. Six Inch Lightweight Tree Ornament - "Saint Rita, Pray For Us" (Italian) - We Only Have 5 Of These Available - First Come - First Served - $4.00 ea. 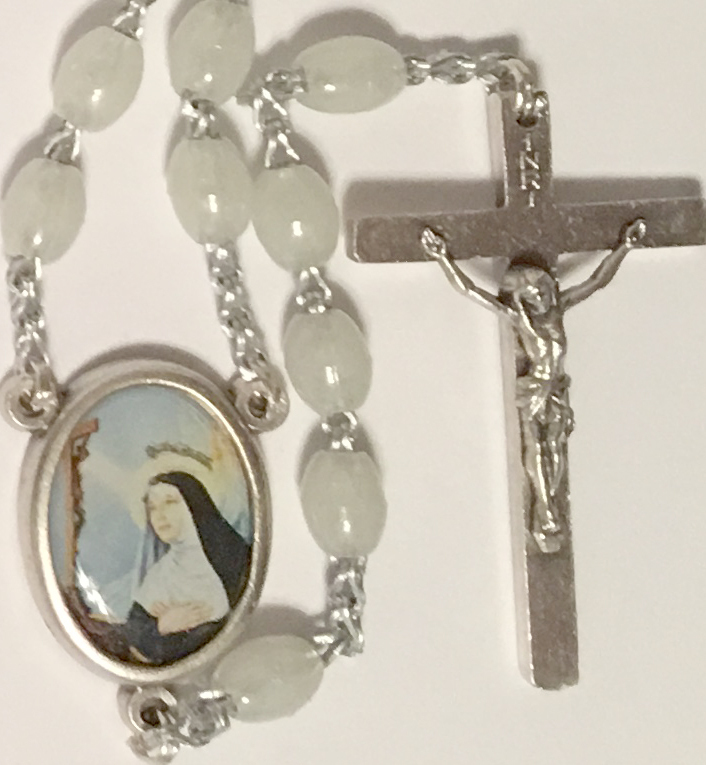 Chaplet of St. Rita - $7.00 ea. 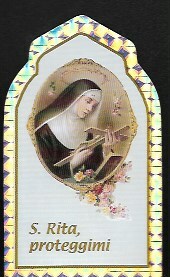 St. Rita Laminated Prayer and Picture Card - Italian - 75¢ ea. 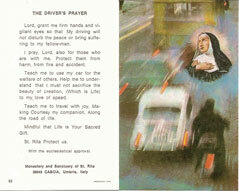 St. Rita The Driver's Prayer Holy Card - 50¢ ea. 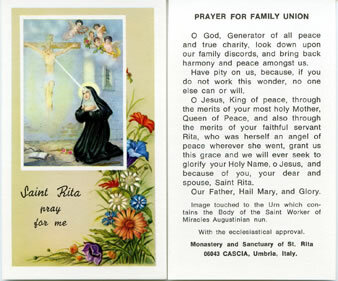 St. Rita Prayer Card - For Family Union - 25¢ ea. 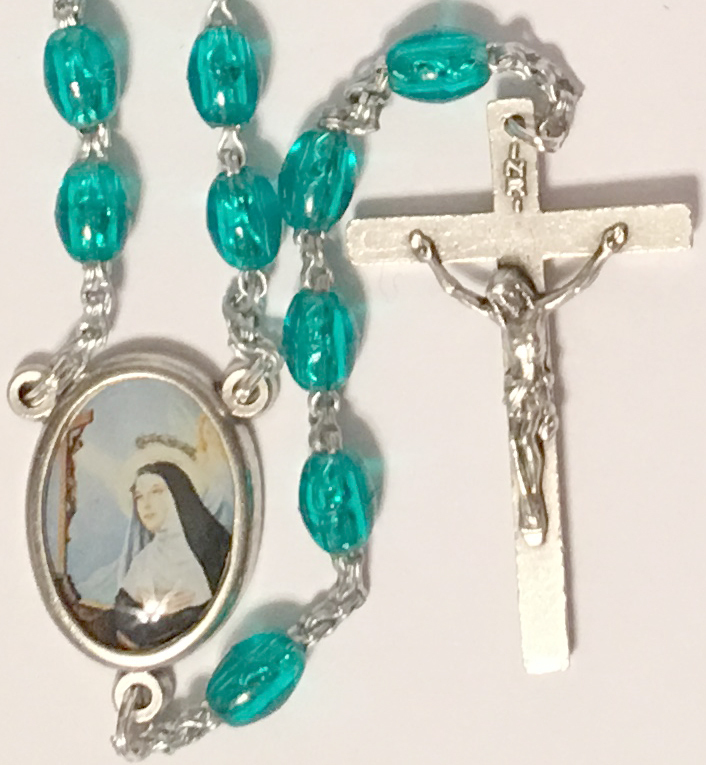 St. Rita Rosary - Available in 4 Colors - $7.50 ea. St. Rita Key Chains - $5.50 ea. One of the other treasures we found in Casica are some of the books shown at the left. 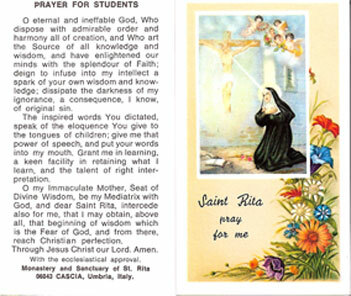 The Crown of Roses to St. Rita of Cascia is a comprehensive book of devotion to St. Rita. Originally published in 1939 and last published in 1962. It contains the Ordinary of the Mass in Latin and English with the Propers for the Feast of St. Rita. It also contains the Vespers of the Feast. The origin and indulgences of the pious practice of the Fifteen Thursdays in Honor of St. Rita is laid out beautifully. Blue Plastic Cover. 262 pp. 32.5" x 5.25"
On Saturday, May 22, 1382  during the reign of Pope Urban VI  in a small village, three miles from Cascia, Rita was born to Antonio Mancini and Amata Ferre. Antonio and Amata were an older pious couple who had consecrated every day of their wedded life to the service of God, spending their time caring for the poor. One night, while Amata was praying, an angel appeared to her in a vision and told her that it was the will of God that she would have a daughter who would, from her birth, be marked with a seal of sanctity. 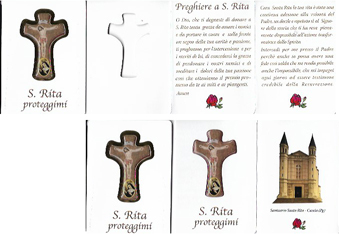 God made it known to Amata that her name would be Rita, which was given to her four days after her birth when she was baptized at St. Mary’s Church in Cascia. Over six centuries later, a small swarm of bees still dwells in a small fissure in the convent wall, midway between Rita’s cell and her sepulchre. The bees have no sting! They live retired for most of the year, but leave their tiny abode during the last few days of Holy Week and return on the feast of St. Rita. On one occasion, one of the bees was sent in a glass vase to Urban VIII. It remained only a day, escaped its glass prison, and then returned to its companions in Cascia. As a small child, Rita preferred being alone to contemplate the Passion of Christ. She was obedient and often knelt at the feet of her aged mother, listening to her holy counsel. The virtues of innocence and purity were deeply rooted in her pure soul. At mealtime she always ate a portion of her food, and gave the rest to the poor. At the age of 12, she consecrated her virginity to God to become a true spouse of Christ. When she made this known to her elderly parents, their hearts were broken as they wished their family to be saved from extinction. Rita’s heart nearly broke when her parents chose a husband for her. She reminded them that instead of entering the convent she had remained to take care of them until God took them to a happier home. Rita spent many hours in prayer waiting for God’s answer to this problem as she didn’t want to be disobedient to her parents, but she wanted to do God’s will. When she realized it was God’s will to be obedient to her parents, she prostrated herself at their feet, humbly asking pardon and was willing to embrace whatever state of life they wished her to enter. Ferdinando, the son of well-to-do and influential parents, was chosen to be Rita’s husband. The Coat of Arms of Pope Urban VIII - Note the Three Bees which are a symbol of his papacy. He was always harsh and cruel to Rita. After a short while, she realized her marriage was an apprenticeship to trials and sorrows. He would have bursts of anger and squandered much of their money. As a wife, Rita was very patient and ran a neat, orderly home. After Ferdinando’s rage would subside, she would remind him of how his anger offended God. She was the model of a perfect wife! In a vision, Ferdinando saw what manner of a man he had become, and became truly penitent and thanked God for giving him such a humble and patient wife. Peace and harmony were established in their home from then on. Shortly after Ferdinando’s conversion, Rita’s parents died, never having seen the two boys, Giovanni and Paulo, who were subsequently born to Rita and Ferdinando. The boys were taught to be obedient, truthful, respectful and indifferent to the things of the world. They were taught to love God and dread sin. Not long after peace and love had been firmly established in this marriage, Ferdinando was attacked and stabbed to death by his enemies. Rita and her sons had been waiting to have dinner with him when they received word of his death. Rits’s heart was broken and she wept inconsolably! “What grieved her heart and soul the most, was that he passed from this life to the other without being fortified with the Viaticum which gives the dying Christian the happy assurance of a safe journey from time to eternity” (Ibid. pp. 50-51). Rita asked God’s pardon and forgiveness for his faults and failings. Rita turned her time and attention to her two growing sons and prayed to preserve their innocence and to guide them on the path of God’s holy law in which she instructed them. As they advanced in age, Rita began noticing a change in her sons. Like their father prior to his conversion, they were becoming sullen and irritable, and now wanted revenge on their father’s murderers. Rita prayed and tried to reason with them. She fled to the crucifix fervently beseeching Christ either to change their desires or no longer spare their lives. Both her sons died within a year, well prepared to go before the judgment seat of God. After the death of her sons, Rita again resolved to live solely for God. She offered rigorous penances, dressed in a garment of hair cloth, increased her number of fasts, and never left home except to go to the church or to help the needy. She pleaded with the prioress at the Augustinian convent to admit her. However, the rule was to admit only young girls whose vocations were certain or widows by special dispensation. Since no widows had been admitted from the time of its foundation, her request was denied. Three requests were made, and all were denied. She saw in a vision the three saints she had called upon to intercede for her. “Come, Rita, my beloved. It is now time for you to enter the Maddelina convent whose door was so often closed against you.” (Ibid. p. 65). 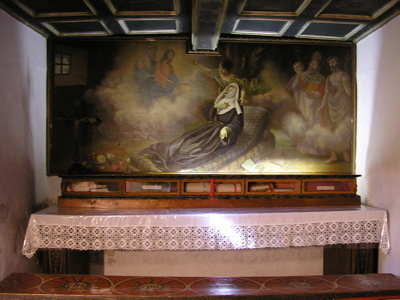 Rita arose and followed St. John the Baptist. Together they climbed through the rugged terrain. Along the way there appeared to her Saints Augustine and Nicholas, radiant in light. She knelt down before them and thanked them for all the favors given her. They commanded her to rise and follow them. They led her to the Maddelina convent and although the doors were closed tightly, she was led into the cloister and was told: “Rita, remain a rational bee in the garden of the Spouse whom you have so long and ardently loved; so that, collecting the flowers of virtues, you may build a sweet honeycomb! You are now in the house of your Spouse, Jesus. Love Him with all your heart and soul, and your eternal salvation is secure. Return thanks to God for so great a favor done in your behalf. Praise His infinite mercy, and publish that there is nothing impossible to God. Rita, the impossible is overcome on your behalf.” The three saints then disappeared and Rita spent the remainder of the night in thanksgiving. When morning came, the nuns were surprised and astonished to see Rita in the convent. Rita told them the story of how she came to be there. All the nuns welcomed her into their community and asked pardon for refusing her so many times. Before receiving her religious habit, Rita returned to Rocca Porrena, her home, to sell her property. She distributed the proceeds among the poor and the needy. Then her long awaited dream to become the bride of Christ occurred when she received the Augustinian habit. She lived as a model novice, surrendering body, soul, and will to her beloved. Some have suggested that the nuns may have looked upon it as a joke, but they admired Rita for her fine sense of obedience. And plant the stick she did  and watered it every day for a year. Then the “stick” put forth leaves and became the most beautiful and bountiful grape vine in the convent garden. Today, almost 600 years later, that same grape vine remains bountiful and beautiful. Every year some of these grapes are sent to the pope, some to cardinals and various people in high positions in the state. The leaves are dried and powdered and sent all over the world as relics to people who are suffering. There have been many cures reported due to use of the grape leaves. The second step to be mastered was the virtue of poverty. To imitate the poverty of her spouse, Jesus Christ, upon Whom she meditated daily, Rita chose to wear the same habit from the day of her entrance into the convent, and was even buried, in that old, patched habit. Her simple cell consisted of a prieu dieu to kneel on, a hard bench for a bed, and a stone pillow. She ate one meal each day, which consisted for the most part of bread and water. The Grape Vine -- as it is today -- which grew from the "stick" that St. Rita placed in the ground and nurtured for one year. The Vine is still very vigorous and produces an abundance of grapes. The door to the chapel in which she was found by the sisters after being miraculously transported there, is on the right. Whenever Rita was obliged to go outside the convent, she always wore a thick veil over her face and never spoke to anyone. In these ways, she mastered chastity, which was the virtue represented by the 3rd step of the ladder. In order to master another virtue, that of silence, Rita often carried a small stone in her mouth to prevent the movement of her tongue. Rita slept only a few hours at night, the rest of the night was spent in prayer or doing needlework. Next to her body she wore a rough garment interwoven with thorns which penetrated her delicate flesh. She often scourged herself with small chains and leather thongs. First for the souls in Purgatory, second, for the benefactors of the convent, and third, for the souls in a state of mortal sin. She became so thin that the bones were visible under her flesh. In fact, for 40 years, Rita led this life of penance and mortification, but was not ill a single day. The mother of a sick child who could not be healed through medical science, sought Rita’s help. Rita told her to have faith and to go home, where she would find her daughter healed. Rita went immediately to the chapel to pray. Upon the mother’s arrival home, she found the child miraculously healed. A woman had for years been possessed by an evil spirit and was being cruelly tormented. 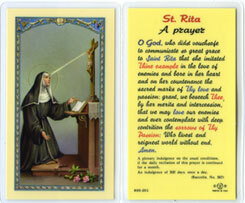 She sought Rita’s prayers. Rita raised her eyes to Heaven, praying and making the sign of the cross on the woman’s head, at which the evil spirit left her. Rita herself was tormented by evil spirits many times throughout her lifetime. But she showed no fear and drove them out with the Sign of the Cross. Roses from the original miraculous rose continue to flourish outside St. Rita's cell at the Monastery at Cascia. The pain was so intense that Rita fell into a swoon. She would have died right there had Jesus not preserved her life. The pain caused by the wound increased daily. It became so ugly, foul smelling and revolting, that Rita became an object of nausea to many who saw it. As a result, Rita asked permission to spend most of her time alone in her cell, but she was happy. Little worms fed themselves on the open wound, thus giving her new occasion to practice patience. The year 1450 was proclaimed by Pope Nicholas V as a Jubilee Year, thus providing many indulgences for those who would go on pilgrimage to Rome. Several of the sisters were given permission to go. At the feet of her superior, St. Rita also asked permission to go. Fearful that those who might observe the ugly and foul smelling wound might be scandalized, the superioress denied her permission to go unless the wound would disappear. Rushing to the feet of her Divine Spouse, Rita humbly sought God’s will, asking Him to take away the wound, but to continue to allow her to suffer the pain from the wound. The wound disappeared at once. Rita gave thanks and rushed to her superioress, who was surprised and astonished  and Rita was granted permission to accompany the other nuns to Rome. The sisters visited the stational churches and the tombs of the martyrs. 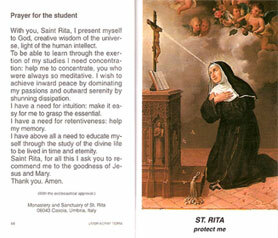 Many were touched by Rita’s devotion and piety. As they returned to the convent  just as Rita stepped over the threshold, the ugly wound reappeared on her forehead, and she suffered intense pains. The offensive odor and the worms reappeared also. When one of the worms fell to the floor, Rita picked it up with care, and placed it back in the wound. She called them “her little angels,” as they were instruments for testing her patience as they recalled to her the intense suffering of her Jesus. She once again retired to her cell so as not to inconvenience the other nuns. For four years after her return from Rome, the pain intensified and her life became a real martyrdom. The Son of God visited and consoled her many times, thus satisfying her thirst. 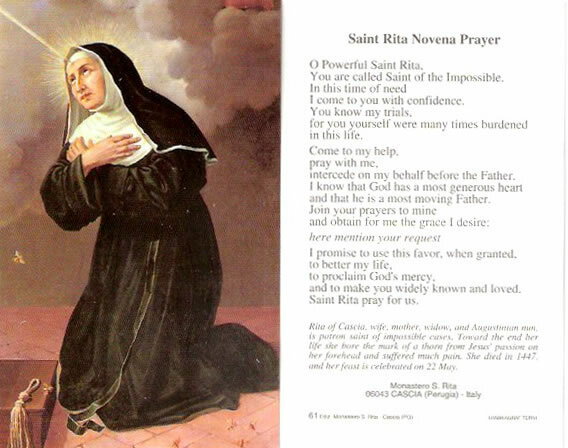 After Our Lord disappeared, there remained in Rita’s heart, so deep a wound that she became ill with divine love, suffering such attacks of fever that she lay on her hard bed, more dead than alive. During those four long years of pain, Rita never complained, and throughout that time was miraculously nourished by the Body and Blood of Jesus. One day in the month of January, one of Rita’s cousins came to visit, asking if she could do any favor for her. Rita was very ill that day but was inspired to ask her cousin to bring a rose from her garden at her former home in Rocca Porrena, which had been sold, the proceeds being given to the poor. The request surprised her cousin, who was convinced no rose would be found since the climate was very cold in January, and one could see nothing but snow and ice. However, upon entering the garden, Rita’s cousin found a beautiful red rose blooming in the snow. She plucked the rose and quickly took it to Rita. She kissed it and gave thanks to God, as did all the nuns. To commemorate this miraculous event, roses are blessed each year in all the churches of the Augustinian order on the Feast of St. Rita and distributed to the faithful. Cuttings from the original rose bush are still growing in the garden outside St. Rita’s cell. Rita also asked her cousin to bring her 2 figs from the frozen fig tree in the garden at Rocca Porrena, which she did. Once again, Rita and the nuns gave thanks. These two miracles were a sign that Rita’s life on this earth was nearing its completion. Rita’s heart filled with joy as she knew her suffering was about to end and that the gates of Heaven would soon be opened to her. The nuns knelt around her bed and gazed with tearful eyes on their beloved sister. Rita humbly asked pardon and forgiveness for her faults and failings, and for the inconveniences she caused them because of the ugly wound on her head and the confinement to her cell. The nuns cried that they were about to lose the one who had so often consoled them. Rita told them that she was getting ready to “close her eyes to the world and open them to God,” so she could live with her beloved Spouse. Rita then asked to receive the Last Sacraments, which she did, then asked her Divine Spouse to open the gates of heaven to her. She then called upon our Blessed Mother, the angels, and her powerful intercessors St. John the Baptist, St. Augustine, and St. Nicholas of Tolentino, to introduce her into the palace of eternal joy. At the moment Rita expired, May 22, 1457, one of the nuns saw angels taking her soul to heaven. She was 76 years old  46 years as an Augustinian nun. Immediately after Rita died, her cell was aglow with a supernatural light and her body sent forth a sweet odor which filled the whole convent. The worms from the wound in her forehead became pretty lights which twinkled like stars, and her wound shown with the brilliance of a ruby. Her frail, thin body became soft and fresh and Rita appeared peaceful and much younger. Bells rang throughout Cascia  in the convents and churches  as though rung by the angels. The nuns prepared her body for burial and she was placed in the same habit and headdress she had worn since her entrance into the convent. Miracles also occurred as people came to pay their last respects to Rita; one of which was a relative whose arm had been paralyzed for years. It was instantly cured. People broke out in joy and gladness as they praised and thanked God for this miracle. The nuns went to the home of Francis Barbari, a local carpenter, to ask if he could build a coffin for Rita. They found him so sick and feeble that he could not move a hand or a foot. He promised to make the coffin if he could be cured through Rita’s intercession. 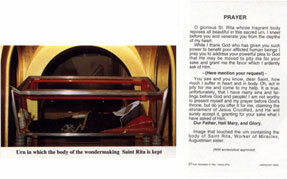 He was immediately cured and made the coffin which still holds St. Rita’s body. Rita’s body was brought to the center of the oratory where the crucifix was when Rita prayed and received the wound in her forehead. An altar has been built over her body so people can still see her face. 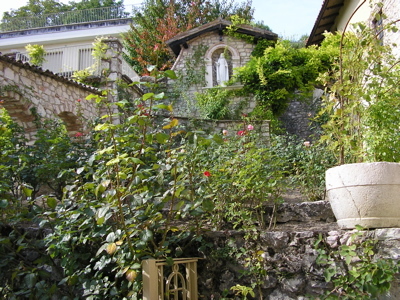 The house in Rocca Porrena where Rita was born and lived later became a church. The Image of St. Rita being received by Our Lord and Our Lady in Heaven. 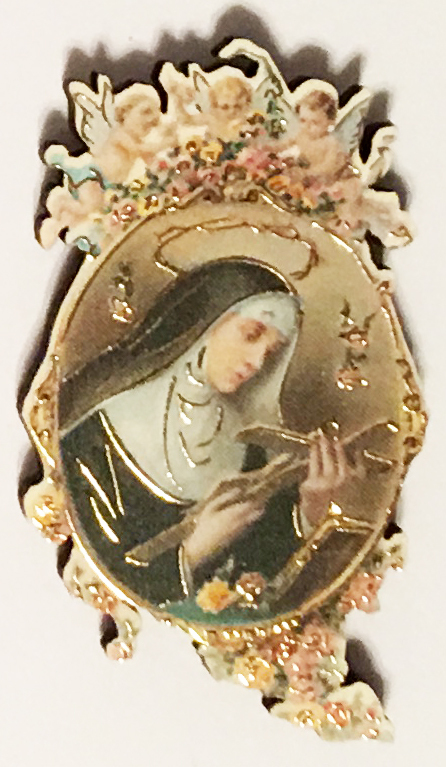 The images rests upon a cabinet which hold many of St. Rita's rellics and other items associated with her. 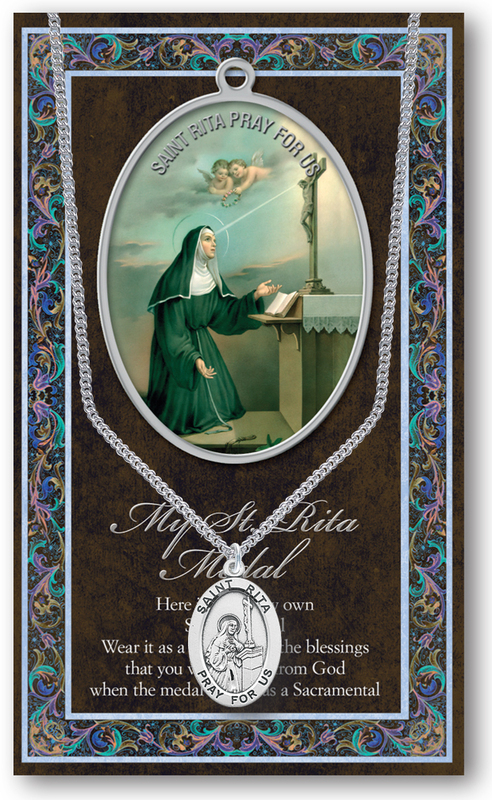 St. Rita’s body remains as it was when she died, it has not become corrupted  she appears as in a sound sleep. From time to time, the nuns place pieces of linen or woolen clothes on her body which they then cut into small pieces to be distributed as 2nd Class relics among the faithful. Many healings and miracles have taken place as a result. The bees that first swarmed around Rita as an infant, and again when she entered the convent, are now retired in the convent wall. Every Holy Week they leave the convent until the feast of St. Rita. Often times during the year they fly through the convent or the garden, only after first flying to Rita’s cell, as if they needed permission to do so for their recreation. They are constant companions of the nuns while they are kneading the dough to make the little breads of St. Rita. These little breads are distributed on her feast day after being touched to the body of St. Rita. They are to be eaten in times of serious illness and are used during bad weather. One should recite an our Father and Hail Mary with their use. There have also been many miracles attributed to the oil from the lamp at St. Rita’s tomb. Her body has also levitated at times, especially on her feast day, May 22. In 1626, Pope Urban VIII requested a thorough investigation into the life of St. Rita in preparation for her beatification. The nuns sent one of the little white bees, which appeared at Rita’s birth, to the Holy Father. These white bees predicted the sanctity of Rita and would be made known by a pope, who himself would come to be associated with bees (there are three bees on his coat of arms). The pope blessed the bee and sent it back to Cascia. The nuns frightened by the commotion implored God, through the intercession of Rita. To their great surprise, the body of the Saint raised itself to the top of the coffin and opened its eyes, which had been closed since the time of the Saint’s death  a period of 171 years. The nuns rang the bells of the convent, and in answer to the call, thousands of people passed before the body of Rita as witnesses to this prodigy. Needless to say, peace was restored between the disputing clergy. Many times Rita would send a priest to an ailing or dying nun to administer the Last Sacraments. The list of miracles goes on and on. On May 24, 1900, Pope Leo XIII declared Blessed Rita a Saint, and further decreed that perpetual veneration should be given her yearly in the universal Church on May 22. Thus ends this abbreviated account of the life, death, beatification and canonization of Rita Mancini; maid, wife, mother, widow, and nun. 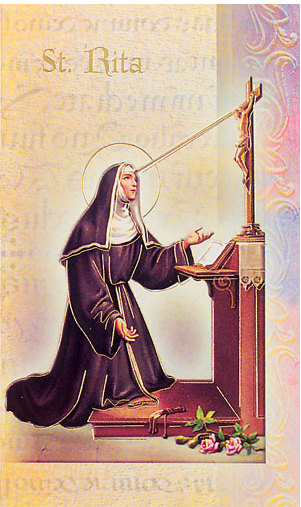 The virtues that made St. Rita particularly pleasing to God were love of neighbor and devotion to Jesus Christ Crucified. These two virtues contain all the wisdom of Christianity which God asks of us all. So let us pray to St. Rita as intercessor in helping us obtain perfection in these two virtues so that we too may enjoy the presence and companionship of God, as does St. Rita, now in Heaven with her Divine Spouse.